Although most homes still use traditional furnaces and air conditioners, geothermal heat pumps are becoming more popular. Everyone agrees that the Earth is round. Except for the folks who belong to the Flat Earth Society! Well, how about the Hot Earth Society? But hey—isn't global warming supposed to be a problem? Well, it is. But the heat generated from inside the Earth's core might actually be able to help. Geothermal energy might be a major way of slowing down global warming. Geothermal comes from the Greek roots "geo"—meaning "earth"—and "therme"—which means "hot." And bending this natural resource to our needs goes back to something people have been doing for their health since the Paleolithic era—bathing in hot springs. Hot spring spas go back as far as the third century BCE in China, and the Romans redirected hot springs to their cities not just for bathing but also to provide a natural source of radiant heat under the floors of the homes and palaces of the wealthy. This redirection of geothermal heat for an urban environment was employed in France in the 14th century and was put to use industrially in Italy as early as 1827. America began geothermal use for urban districts in the 1890s, and some other countries followed suit over the following decades. Geothermal energy is generated 4,000 miles below the Earth's surface. All rocks—and the Earth is no exception—produce temperatures that are even hotter than the surface of the sun through the continual decay of radioactive particles in the rock's interior, or the Earth's core. The core has two layers: the inner core is made of pure iron under such immense gravitational pressure that it is a solid mass despite being the hottest part of the planet--usually estimated at between 5,000 and 10,000 degrees Celsius (9,000 to 18,000 degrees Fahrenheit). The outer core, made up primarily of iron, is cooler than the inner core, but because it's under less pressure, it is liquid. Surrounding the core is the relatively cooler mantle, a mixture of magma, or very hot melted rock, and solid rock that is almost 2,000 miles thick! Finally, there is the Earth's cold, rocky crust—like the crust on a loaf of bread—and in the same way that a handmade loaf has nooks, crannies, and bumps, so does the Earth's crust—these are the indentations where the oceans' "floors" lie and the bumps that are continents. Beneath the oceans, the crusts can be as much five miles thick, while the parts of the crust that make up the continents are between 15 and 35 miles thick. The Earth's tectonic plates, the huge pieces that together make up the crust, slowly drift on the surface of the mantle. Over millennia, their movements change the landscape of the planet, pushing mountain ranges upward when they collide with each other, and breaking the plates themselves to create separate continents. These forces can also force open cracks in the crust that allow the magma and intense heat held by the rocks and water deep underground to burst through cracks in the plates in eruptions called volcanoes. But this heat doesn't just have to be released in an uncontrolled and dangerous way. We can put it to use. By digging underground and extracting this heated water with a heat pump, we can heat our homes, and we can also produce electricity. Deep geothermal wells and geysers were used to heat urban areas and greenhouses over a hundred years ago, so the technology for gathering this heat is not new. In the 20th century, as soon as the power of electricity was recognized as something that could be harnessed and used on a vast scale, geothermal power was immediately thought of as a way to harness and produce electricity. 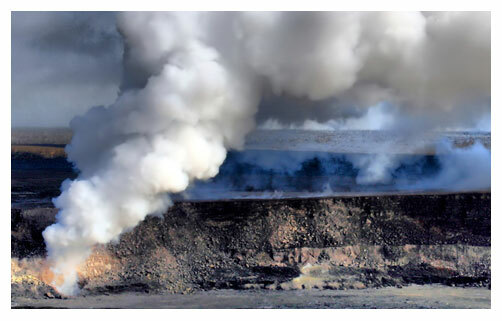 The one big limitation was that geothermal power could only be harnessed near areas were it was plentiful—such as in boundary areas in tectonic plates, where there is essentially a "doorway" of sorts to the center of the earth, especially in the area known geographically as the "Ring of Fire," where there are tectonic plate boundaries that run like a road around the entire rim of the Pacific Ocean. Today, however, we have come up with a variety of ways of accessing this awesome power through the use of geothermal wells. Now a warning: geothermal wells do release greenhouse gases into the air! However, these are much, much lower and less significant in terms of global warming than the greenhouse gases currently being released by conventional means of generating energy. The most easily obtainable geothermal energy is for use with direct and district heating systems, which heat homes and other buildings and utilize water from hot springs that is relatively near the Earth's surface. If you require water or steam at extremely high temperatures, such as for plants that generate geothermal electricity, the answer is simple: you build your power plant near a geothermal reservoir! Geothermal heat pumps, used to control the temperature inside buildings, use the Earth's surface in a different way, relying on the relative constancy of the temperature below the Earth's surface. Despite the change in seasons above the Earth's surface, the temperature just below it (say, ten feet down) tends to remain at a constant of between 50 and 60 degrees Fahrenheit (which is why some animals are able to burrow just below ground and there survive even the harshest winter). Not just that, but the area stays cool, as well. Ever dig your toes deep into the garden dirt on a scorching day? It's pleasantly cool down there. This relative stability of temperature, which is warmer than above-ground temperatures in winter and cooler than above-ground temperatures in summer, is the foundation for the use of geothermal heat pumps. And as far as renewability goes, well, it's always raining somewhere, and that's all you need to keep the interior of the Earth as piping hot as a kettle on the boil for tea!